I am glad to read you enjoyed this one, Lark. It's been on my radar for awhile now. I haven't always liked Alice in Wonderland related stories, but they seem to have grown on me in recent years. There's something about them that makes me keep reading them, although they're not always as good as I want them to be. Like Splintered; it was good, but not GOOD. But I liked this one. It's a darker version Alice in Wonderland, but maybe that's why it worked. Well now, I'm intrigued. 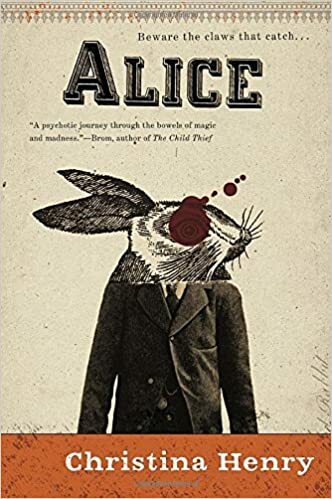 I hated the original Alice but there something about retellings that make me curious. I might have to check this one out. I love retellings; I like the different aspects from the originals and it's always refreshing to see where the "new" stories go. I'll keep this book in mind. Some authors are really clever and creative with their retellings. Henry's version of Alice was completely unexpected; and she really made it her own. Which was nice. Sounds good and creepy! I'll have to put it on my Halloween reading list. It would be a good October/Halloween read! I've never heard of this book before, but it sounds really good. I don't know why, but I like a good insane asylum story! Oooh, think I will have to add this one to my list!